I am trying to think of a way to make this view work. It is a single view that contains more views, each of them responsible for a subset of the functionality in the view. This is the first time that I am dealing with smart client architecture for a long time. It is surprising to see how much the web affect my thinking. I am having trouble dealing with the stateful nature of things. The problem is that those views are embedded inside a parent view. And since those sub views are both views and controls inside the parent view, I can't think of a good way to deal with both of them at once. I think that I am relying on the designer more than is healthy for me. I know how to solve the issue, break those into three views and build them at runtime, I just... hesitate before doing this. Although I am not really sure why. Another option is to register the view instances when the parent view loads, but that means that the parent view has to know about the IoC container, and that makes me more uncomfortable. 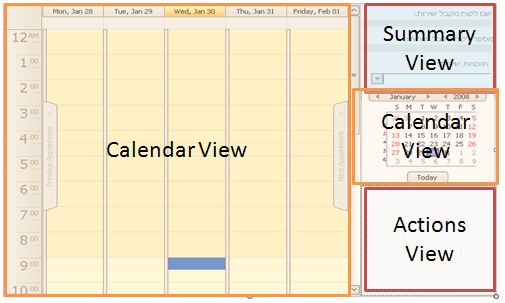 It is a bit more of a problem when I consider that there are two associated calendar views, which compose a single view. Let us assume that we need to build a quote generation program. 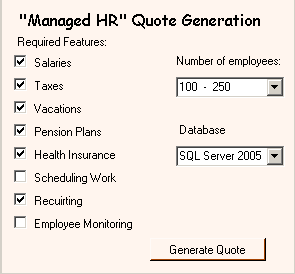 This mean that we need to generate a quote out of the customer desires and the system requirements. 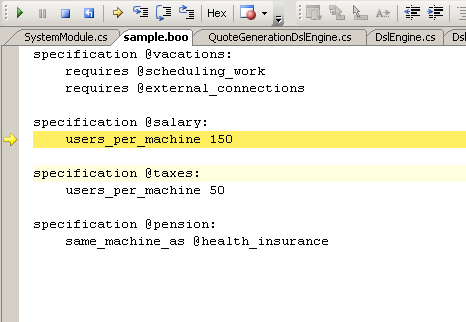 The Salary module is specification is a machine per every 150 users. The Taxes module requires a machine per 50 users. The Vacations module requires the Scheduling Work module. The Vacations module requires the External Connections module. The Pension Plans module requires the External Connections module. The Pension Plans module must be on the same machine as the Health Insurance module. The Health Insurance module requires the External Connections module. The Recruiting module requires a connection to the internet, and therefore requires a fire wall of the recommended list. The problem with this approach is that I wonder, is this really something that you need a DSL for? You can do the same using XML very easily. Which would be much harder to express in XML. Of course, then we are not in the purely declarative DSL anymore. There is no relation to Rhino Security, just to be clear. I simply wanted a sample for a DSL, and this seems natural enough. I am looking at getting a new laptop. This is something that should serve as a development machine, and I am getting tired of waiting for the computer to do its work. As such, I intend to invest in a high end machine, but I am still considering which and what. Minimum Requirements are 4GB RAM, Dual Core, Fast HD, big screen. Video doesn't interest me, since even the low end ones are more than I would ever want. Weight is also not an issue, I would be perfectly happy with a laptop that came with its own wheelbarrow. I am seriously thinking about getting a laptop with a solid state drive, and I am beginning to wonder if quad core is worth the price. Then again, I am currently writing dream checks for it, which is why I feel like I can go wild with all the features. I am going to give a talk about the high end usages of OR/M and what it can do to an application design. I have about one hour for this, and plenty topics. I am trying to think about what topics are both interesting and important to be included. Anything that you like? Anything that you would like to me to talk about that isn't here? Okay, I renamed Boo Build System to Bake. Now you can cut the jokes and actually integrate it into a PC environment. The repository is here, although you can just grab the binaries. It has the three methods that I thought about (plus overloads), and with the exception of renaming Why() to GetAuthorizationInformation(), it is pretty much how I conceived it. That change was motivated by the desire to get standard API concepts. Why() isn't a really good method name, after all. This is a much bigger interface, and it composes almost everything that you need to do in order to create the security model that you want. I am at the point where this is getting just a tad too big, another few methods and I'll need to break it in two, I think. I am not quite sure how to do this and keep it cohesive. Wait, why do we need things like CreateOperation() in the first place? 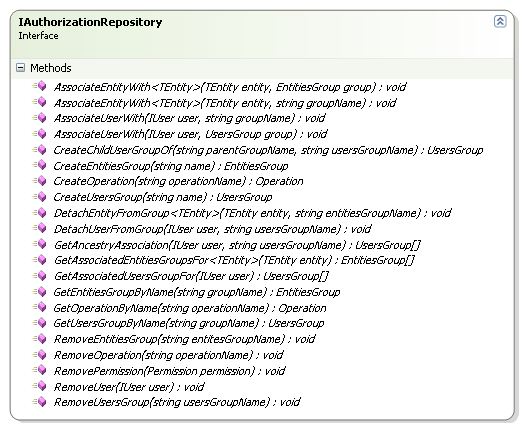 Can't we just create the operation and call Repository<Operation>.Save() ? No, you can't, this interface is about more than just simple persistence. It is also handling logic related to keeping the security model. What do I mean by that? For example, CreateOperation("/Account/Edit") will actually generate two operations, "/Account" and "/Account/Edit", where the first is the parent of the second. This interface also ensures that we are playing nicely with the second level cache, which is also important. I did say that this interface is almost everything, what did I leave out? This allow the current user to edit all accounts, and deny all members of the administrators group account editing permission. And that sums all the interfaces that you have to deal with in order to work with Rhino Security. Next, the required extension points. Given a user, how would you find all the users that are members of all the blogs that the user is a member of? I have a fairly strong opinions about the way I build software, and I rarely want to compromise on them. When I want to build good software, I tend to do this with the hindsight of what is not working. As such, I tend to be... demanding from the tools that I use. What follows are a list of commits logs that I can directly correlate to requirements from Rhino Security. All of them are from the last week or so. Applying patch (with modifications) from Jesse Napier, to support unlocking collections from the cache. Adding tests to 2nd level cache. Applying patch from Roger Kratz, performance improvements on Guid types. Adding supporting for paging sub queries. Need to handle the generic version of dictionaries as well. Adding the ability to specify a where parameter on the table generator, which allows to use a single table for all the entities. Fixing bug that occurs when loading two many to many collection eagerly from the same table, where one of them is null. Generic components will take their lifecycle / interceptors from the parent generic handler instead of the currently resolving handler. Adding ModelValidated event, to allow external frameworks to modify the model before the HBM is generated. Adding tests for With.QueryCache(), making sure that With.QueryCache() can be entered recursively. Increased timeout of AsyncBulkInsertAppenderTestFixture so it can actually run on my pitiful laptop. Adding error handling for AllAssemblies. Adding a way to execute an IConfigurationRunner instance that was pre-compiled. Without those modifications, I would probably have been able to build the solution I wanted, but it would have to work around those issues. By having control the entire breadth and width or the stack, I can make sure that my solution is ideally suited to what I think is the best approach. As an aside, it turn out that other people tend to benefit from that.